Awash with bars, cafes and restaurants, Cairns is a tropical town geared up to receive visitors. It's so close to the Great Barrier Reef, the magical Daintree Rainforest and hippy town Kuranda that it's a magnet for everyone who wants to explore this region, and the best places to stay in Cairns really do come in all shapes, sizes and budgets. You might think Cairns' lack of a beach might put a dampener on the party, but for many people Cairns is the beginning or the end of a journey up Australia's east coast, and this is a great place to meet people and share tips and journeys. Most people cope just fine with the beautiful lagoon in the centre of town, or catch a bus to the near-perfect beaches just to the north of town. Cairns is surrounded by sugar cane, coffee and banana country, which creates an unexpected order to the views around town. As well as being used as a base for some fantastic day trips, Cairns is becoming a bit of an adventure capital, with diving, sailing, skydiving, hang gliding, ballooning, kayaking, whale watching and mountain biking all on offer. Cairns also has a number of attractions set up solely for their numerous guests - like the Wildlife Dome, which is like a fancy indoor zoo, the Tjapukai Cultural Park, an indigenous-owned cultural centre and numerous markets. There are also plenty of operators who'll ferry you out into the Atherton Tablelands and up the coast in 4WDs. There is, of course, the Kuranda Scenic Railway. You're surrounded by pristine rainforest riddled with little tracks and trails. Such a popular destination with lots to see and do means that many of the best places to stay in Cairns are snapped up quickly, so do plan ahead and make your booking early. The Shangri-La Hotel, Cairns is a five star luxury resort with all the trappings. 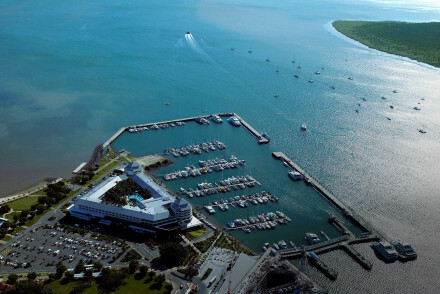 You're right on the edge of the marina, with views over the water, the lush, topical hotel gardens or Cairns itself. As well as enjoying a peaceful spot, there are excellent facilities, including a fitness centre, and of course, waterfront dining. The QT Port Douglas is just back from the beach, and out of town, so it's ideal for visitors looking for a peaceful stay amongst tropical gardens. The decor is chic and retro and the well lit rooms look out onto either the hotel lagoon pool or the gardens. They also have apartments with one or two bedrooms. Silky Oaks Lodge is a luxurious eco lodge right on the banks of the Mossman River, set in 88 acres of its own rainforest on the edge of the Daintree. Accommodation comprises a collection of tree-houses and suites in a larger house right on the river, the decor is sumptuous and elegant. There's also a great restaurant and a pampering spa - so you can't find many more romantic hotels close to the Daintree Rainforest. Cairns Airport is an international airport with connections to Dubai. Abu Dhabi, Hong Kong and Singapore, which means you can probably get a flight to Cairns with just one change from an airport near you. Alternatively Brisbane Airport is another international option. From Cairns Airport there are plentiful taxis and private limousines, but not a lot in the way of public transport. Like the rest of Queensland, Cairns really only has two seasons, the warm dry season, which is technically Australia’s winter, between April and September, and the hot wet season, between October and March. It probably goes without saying but the warm, dry season in the weeks outside the school holidays, is probably the best time to visit. Consider the best places to stay in Port Douglas? Or the best places to stay in the Whitsunday Islands? Five star luxury with all the trappings. Large and spacious rooms all with balconies with views either over the city, gardens or bay. Excellent facilities including outdoor pool, fitness centre and spa, and waterfront dining. A great spot on the Marina away from the main street.